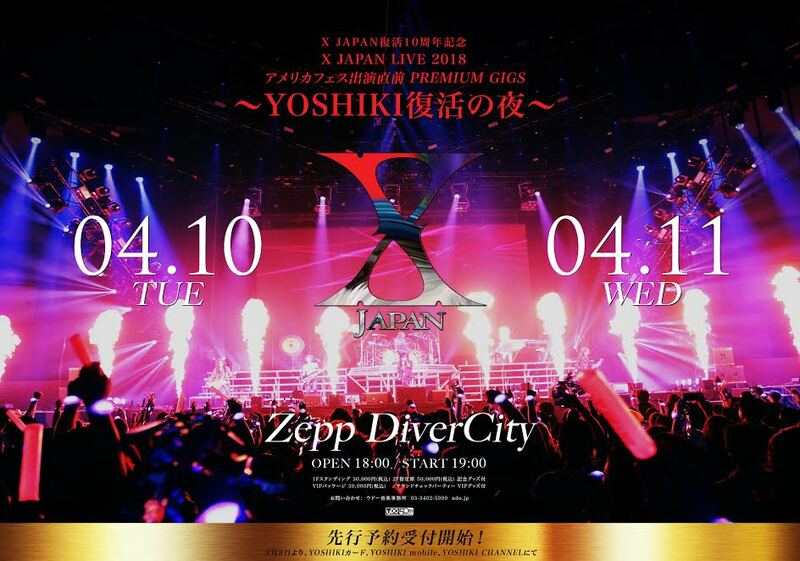 X JAPAN has announced that it will perform a pair of solo concerts to commemorate the 10th anniversary of their re-unification -- "X JAPAN LIVE 2018 pre-American music festival appearance PREMIUM GIGS ~ YOSHIKI: A Night Of Resurrection ~" -- on April 10 and 11 at Zepp DiverCity (Tokyo). On March 8, X JAPAN leader YOSHIKI (drums, piano) appeared live from Los Angeles via his "YOSHIKI CHANNEL" broadcast on the NicoNico live-streaming service. The program, titled "X JAPAN Breaking News ~ YOSHIKI makes a sudden appearance from overseas ~", featured YOSHIKI himself announcing the concert dates. Scheduled special guests include Richard Fortus (Guns N’ Roses) and Wes Borland (Limp Bizkit), who performed with X JAPAN in three reunion shows at the Tokyo Dome in March 2008. X JAPAN is scheduled to perform on April 14 and 21 at the Coachella 2018 Music Festival in Indio, California. Since YOSHIKI’s return from surgery last year, this series of concerts will be his first full stage performances on drums. During the broadcast, YOSHIKI said that he would play drums as much he can be allowed, and that these performances would be a test of his resolve. Tickets to "X JAPAN LIVE 2018 Pre-American Music Festival Appearance PREMIUM GIGS ~ YOSHIKI: A Night Of Resurrection ~" will be available starting today via the fan clubs for each respective member of X JAPAN. In addition, remote live viewing theatrical broadcasts of the concert will take place on April 11 in Japan, Hong Kong, Taiwan, and South Korea. "X JAPAN LIVE 2018 pre-American music festival appearance PREMIUM GIGS ~ YOSHIKI: A Night Of Resurrection"
VIDEO: "Yoshiki’s return to drums! X Japan to perform at Coachella 2018"